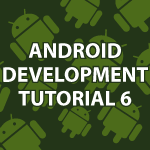 Welcome to part 6 of my Android Development Tutorial! Over the next few videos I will cover a tremendous amount of information. You can get the whole app right now if you can’t wait here Android Stock Quote App. actually its only when i create it in the same workspace as the other apps we have made previously. You should try to watch the video and actually do everything yourself following Derek. I’ve done so and the layout of my app and that of the app described in the tutorial match perfectly (normally, the workspace folder that is set shouldn’t matter). Take the time to write the code yourself instead of just copying everything – I’m sure you know these two are very different things in terms of learning. There is android:gravity=”center” and android:layout_gravity=”center”. You sometimes have to set them both to get the center effect. duplicate the tableRow1 in activity_main.xml at line 013 and 087. For some reason the code did not show up in my previous comment. About: Run-time error “android.widget.ScrollView cannot be cast to android.widget.TableLayout”. The wrong way: Pay attention to id lines. The right way: Pay attention to id lines. Mike thanks for the tip ran into the same thing. This is a realy awesome tuterial by the way!!! Some people seem to have the same problem because they are entering a comma in the price amount. I guess that is common in other countries? I didn’t have time to cover everything and provide 100% error checking. Sorry about that. Yes, all of Europe, South America and Russia uses the komma as decimal seperator. It gave problems with my program too in previous tipApp. Solution was to change “region and language” setting in my windows installation to English. Hi, How I can read an XML content but only if I have been identified by a username and password? Not sure if you mention the manifest file but, the quote button wouldn’t work until I set the permission for the device to use the internet in the android manifest xml. thank you for these great tutorials, I make my debut in programming for android and they are very helpful to me . However, I currently have a problem with the interface. When I desire to center the text in the textView , I use the command android : gravity = ” center_horizontal ” but when I look at the interface, the text is shifted to the right. I feel I should set limits . If I understand correctly, the android command: layout_width = ” match_parent ” defined limits . android: id = "@ + id / stockSymbolTextView "
android: layout_width = " match_parent "
android: layout_height = " wrap_content "
android: gravity = " center_horizontal "
All updates have been made. Are you already seen this? Thank you . I hope you can help me. You may also want to try messing with weight if you are still having problems. Love the tutorials. Thanks for spending the time to teach us newbies! I have watched tutorials 6 – 8 for the multiple activity stock quote picker and I still can’t get it working. Do I need to edit the android manifest aswell? I couldn’t find it in the code you posted. The application just seems to crash as soon as I run it. Also, do I need to use a specific build? I’m using 4.0.3. Sorry, but I think Yahoo changed their data. You’ll have to look at it and use the different tags they now use. I’ll be making an updated web services tutorial in the next week. That will allow everything to always work and also teach how to make your own web services.